Throughout the lifespan, play supports neurological growth and development while building complex, skilled, flexible, responsive, and socially adept brains. Play also improves the natural ability to convey emotions. Yet clients who suffer from early trauma sometimes experience a reduced capacity for play which may impact their potential for spontaneous laughter, joy, excitement, creativity and connection. Some clinicians are comfortable integrating improvisation and playfulness into their practice. Others have difficulty embracing the uncertainty which may emerge, particularly when delving into the pain experienced by their clients. During this program, leading researchers and clinicians will draw upon the evidence-based research in neuroscience and positive psychology to examine ways that clinicians can stimulate client resilience, creativity and spontaneity using play. Through lectures, case presentations and interactive panels, participants will increase their therapeutic efficacy by developing skills which enhance their receptiveness and presence during client sessions. Presentations will also provide skills for connecting empathically and attuning to non-verbal body reactions and movements so therapists can resonate with clients at a deep, somatic level. Innovative methods for including humor, positive psychology and play in the therapeutic milieu will be explored with the goal of bringing more joy and creativity into the therapeutic process." • Discuss ways that Interpersonal Neurobiology informs clinical intuition as a fast acting automatic mode of implicit learning. • Explain how play creates opportunities for shared joy and connection. 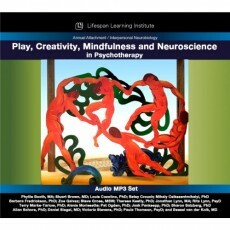 • Discuss the role of creativity in Plasticity and Learning. • Describe the evolutionary role of play in learning and education. • Outline specific factors that enhance and / or inhibit play and creativity. • Explain a scenario seen in treatment videos when a “moment of meeting” was demonstrated. • Compare the roles of the right brain and left brain in regulation theory. • Relate how right brain functions are expressed on both sides of the therapeutic alliance. • Explain how intentional play can be used as an “antidote” to experiences of psychological trauma. • Discuss the states of mind regarding attachment, trauma and loss and their association with psychological regulatory processes. • Describe why the physical actions that are compatible with play and positive emotions are difficult for traumatized clients. • Appraise states of mind when dealing with trauma and loss. • Distinguish different strategies to deal with patients who have secure, insecure and disorganized attachments. • Explain the relationship between mindfulness meditation and resilience. • Summarize the current psychological understanding of creativity. • State the stages of the creative process and the links between affective neurobiology, attachment theory and cognitive elements of creative thinking, imagination and play as part of therapeutic technique. • Summarize how current developmental neuroscience is exploring right brain functions of creativity, intuition, and insight. • Outline the Systems Theory of Creativity. • Devise new modes of using the body to connect with deep traumatic blocks. • Evaluate Clinical treatment recommendations that can nurture creativity. The Lifespan Learning Institute designates this live activity for a maximum of 18 AMA PRA Category 1 Credit(s)™. Physicians should claim only the credit commensurate with the extent of their participation in the activity. This credit may also be applied to the CMA Certification in Continuing Medical Education. IMPORTANT NOTICE: California Association of Marriage and Family Therapists, Board of Registered Nurses and IMQ/CMA are California accrediting organizations. It is the responsibility of participants licensed in other states to verify whether their Licensing Board will accept the CE Credit we offer. Time 18 hrs 22 min.